Range Rover has unveiled its latest ‘green’ compact luxury 4X4 with ‘X-Ray vision’ that enable drivers to ‘see’ through the bonnet to view what lies on beneath on the road below and ‘eyes in the back of its head’ to show what’s coming up behind. The new second-generation British-built Evoque off-roader is built with electrification and hybrid power in mind, and has a non-leather cloth option designed for vegetarians and vegans and made from recycled plastic bottles. Significantly, it features unique ‘ground view’ technology that makes its bonnet ‘invisible’ to the driver so he or she has a view of any rough or extreme terrain - or high city centre kerbs - that are lurking underneath or just ahead, but normally out of sight. The firm said its ClearSight Ground View technology marks ‘a world first’ for the compact luxury 4X4 which is powered by a range of mild-hybrid petrol and diesel engines, with a plug in hybrid to follow next year and the potential for a fully electric version. The new all-seeing Evoque was unveiled at a star-studded international launch at the Old Truman Brewery in East London’s trendy Brick Lane where fashion and Vogue cover model Adwoa Aboah was to appear wearing a dress made out of the very same Kvadrat material made from recycled plastic bottles. Others on the guest list were expected to include ‘Made in Chelsea’ celebrities Millie Mackintosh and new husband Hugo Taylor, as well as Jamie Laing, TV’s ‘Bodyguard’ and tipped James Bond contender Richard Madden, and ‘Saturdays’ pop star Mollie King. The X-Ray ‘ground view’ works like this. Cameras mounted in the front grille and on the door mirrors project their view onto the central touchscreen of the 4X4 so the driver can see in a 180 degree view what is ahead of and underneath the front of the vehicle. 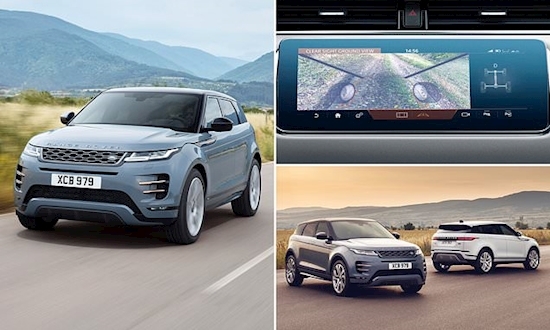 Land Rover said:’ The new Range Rover Evoque is the first in the world to feature Ground View technology, which effectively makes the bonnet invisible by projecting camera imagery onto the upper touchscreen to show the driver a 180-degree view under the front of the vehicle. Land Rover first signalled the X-Ray technology in 2014 but this is its first use in a showroom vehicle available to customers. The new 4X4 also has ‘eyes in the back of its head’ thanks to a ‘smart’ rear-view mirror which transforms at the touch of a button into a high definition video screen displaying the images from a rear-facing camera positioned above the rear window with a wider 50-degree field of vision. It means the driver’s view remains unrestricted by passengers or large items in the back. This technology also delivers clearer visibility in low light conditions. The camera is designed with a protective lip and a special water repellant coating to prevent mud and water spray soiling the lens. Each new Evoque contains up to 33kg of recycled or natural material including special non-leather Kvadrat suedecloth made from 53 recycled bottles per vehicle. There is also the option of a new Eucalyptus textile produced from natural fibres. The new Evoque range promises fuel economy of up to 50.4mpg. It is also the first Land Rover to be equipped with advanced artificial intelligence software that ‘learns’ the driver’s habits over time. The ‘self-learning’ technology recognises the driver from their key fob and phone and will set up their seat and steering column position on approach, allowing for up to eight profiles to be registered. Priced from £31,600 to £40,350, the new second generation Evoque has been ‘developed for electrification’. At launch there is a range of 48-volt battery-aided ‘mild hybrid’ 4-cylinder petrol and diesel engines. An eco-friendly 3-cylinder plug-in hybrid version to follow 12 months after launch, and it opens the way for a fully electric version. The 48-volt mild hybrid powertrain uses an engine mounted generator to collect or ‘harvest’ energy normally lost during deceleration and the store it in the under-floor battery. At speeds below 11mph the engine shuts off while the driver applies the brakes. When the driver pulls away, the stored energy is redeployed to boost the engine under acceleration and thus reduce fuel consumption. The new Evoque is available in four trim levels: S, SE, HSE and personalised ‘R-Dynamic’, though a fully stocked ‘First Edition’ costing around £55,000 will be available in the first year only. The Evoque P300 all-wheel drive model costing £40,350 is powered by a 300 horse-power (HP) 2.0 litre 4-cylinder petrol engine linked to ‘mild hybrid’ electric motor and battery and a 9-speed automatic gear-box. It accelerates from rest to 60mph in 6.3 seconds up to a top speed of 150mph, with fuel economy of 28.7mpg and CO2 emissions of 186g/km. The entry-level new Evoque costing from £31,600 is the 2-wheel-drive D150 with a 2.0 litre 150 horse-power four-cylinder diesel engine linked to a six-speed manual gear-box which accelerates from 0-60mph in 9.9 seconds up to a top speed of 125mph with fuel economy of 42mpg and CO2 emissions of 143g/km. Thanks to a longer wheel-base, the new Evoque has more interior space and promises more knee-room for passengers, more luggage space sufficient for a set of golf clubs, and extra storage for small items. The larger glove-box and centre cubby-hole can now fit computer tablets, hand-bags and bottles. There is a 10 per cent increase in luggage space to 591 litres, increasing 1,383 litres with flexible second-row seats folded down. New 21 inch wheels are available and the new Evoque can now wade through 600mm of water – up by 100mm on the previous model. The 4X4 also features super-slim Matrix LED headlights. To help cope with conditions on and off the road, second generation ‘Terrain Response 2’ is available as standard for Evoques with All-Wheel Drive and automatic transmission. This comprises four modes - Comfort, Sand, Grass-Gravel-Snow, and Mud & Ruts. But a new ‘Auto mode makes life even easier by automatically selecting the most appropriate setting for the conditions and adjusting the vehicle’s performance to suit the terrain. There is also Hill Descent and Gradient Release Control and All-Terrain Progress Control. The first generation Evoque was launched eight years ago (2010) at Kensington palace with the help of former Spice Girl Victoria Beckham - ‘Posh Spice’ -who later went on to help style a blinged up £200,000 ‘VB’ limited edition version bearing her name. Since launch more than 772,00 Evoques been sold, one in 5 in the UK. The new Evoque is being built at jaguar Land Rover’s factory at Halewood on Merseyside following £1billion of investment, including £110million at the plant.